NEW YORK (CNS) — Hollywood offers a belated Christmas gift in “Paddington” (TWC-Dimension), a delightful, warmhearted comedy for the entire family. The screen adventures of the talking bear (voice of Ben Whishaw) from “darkest Peru,” who travels to Britain in search of a new home, are based on the celebrated series of children’s books by Michael Bond. Writer-director Paul King deftly balances manic comedy with genuine affection for his source material in a story that reinforces a timeless message about being kind to strangers. His film, which mixes animation and live action, contains a few scary moments as it barrels along, but nothing too upsetting for even the youngest viewers. We first meet our initially nameless hero, an orphan, in the Peruvian jungle where he lives with his Aunt Lucy (voice of Imelda Staunton) and Uncle Pastuzo (voice of Michael Gambon). Their unusual fondness for all things British (inspired by a passing explorer) includes an addiction to orange marmalade. 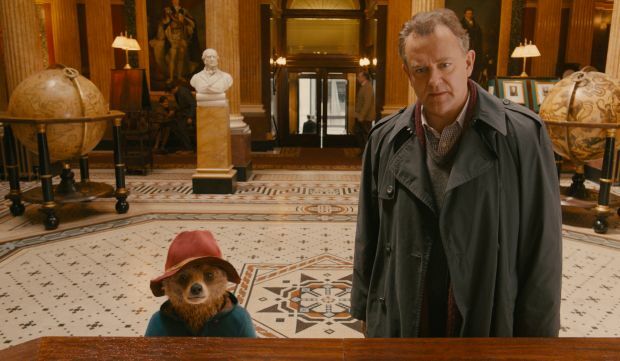 Arriving at the Victorian train station from which he eventually takes his name, Paddington meets the Brown family: Henry (Hugh Bonneville) and Mary (Sally Hawkins) and their two children, Judy (Madeleine Harris) and Jonathan (Samuel Joslin). Mary takes pity on the refugee and insists he come home with them, despite Henry’s objections. Paddington’s adjustment to life in a townhouse is rocky, to say the least, and includes several gross-out moments that will delight kiddies. Still, with his signature red hat and blue duffel coat, the bear wins the hearts of the “curious tribe” that is his newfound clan. But danger lurks around the corner in the guise of Millicent (Nicole Kidman), a sadistic museum taxidermist who thinks Paddington would make a fine addition to her collection. “Families stick together,” Henry proclaims, as the Browns rally to protect their furry friend. The film contains some mildly scary action sequences, brief innuendo and a few instances of bathroom humor. The Catholic News Service classification is A-II — adults and adolescents. The Motion Picture Association of America rating is PG — parental guidance suggested. Some material may not be suitable for children.